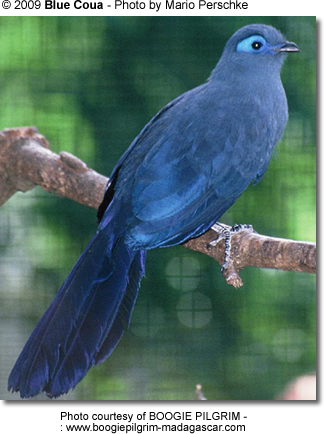 The Blue Coua or Blue Madagascar Coucal (Coua caerulea) is a non-parasitic cuckoo that occurs naturally on the island of Madagascar located off the southeastern coast of Africa. 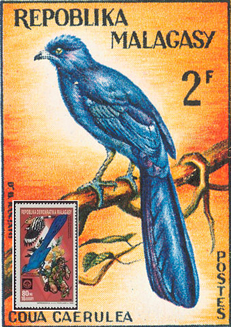 The Blue Couas are mostly found in eastern and northwestern Madagascar. They favor subtropical or tropical dry or moist lowland forests, mangroves and moist montanes. They are still quite common within their range; however, these beautiful birds are being trapped and hunted, which puts them at risk of extinction in the future. 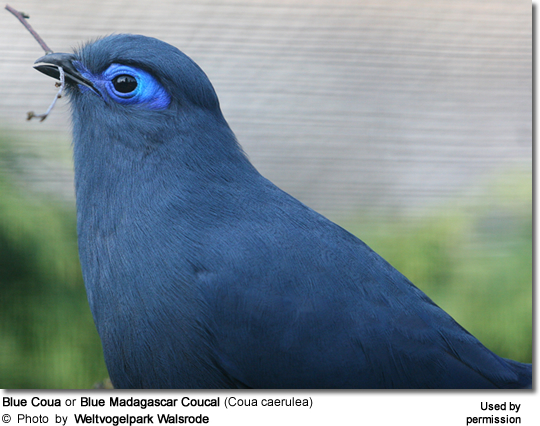 The Blue Couas measure between 18.9–19.7 inches (48–50 cm) in length, including the long tail. 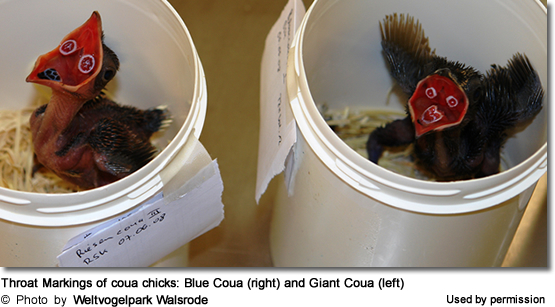 They weigh around 8.2 oz or 235 g.
The plumage is dark blue above and below. 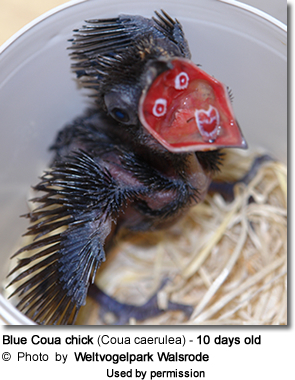 They have a patch of bare, oval, blue-colored skin around each eye and black bills. Like all other members of the Cuckoo family, they have large feet with reversible third toes. The diet consists mainly of various insects, small reptiles and fruits, and likely seeds. 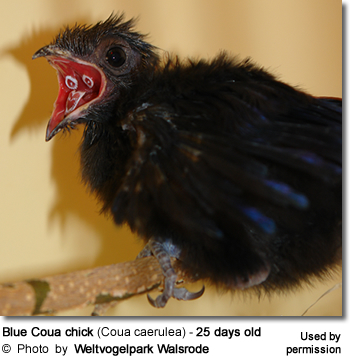 Unlike cuckoos, Blue Couas build their own nests out of twigs and leaves, and incubate their own white-colored eggs. A clutch usually consists of 1 egg. They also raise their own young. The nests are usually well hidden in trees or bushes.